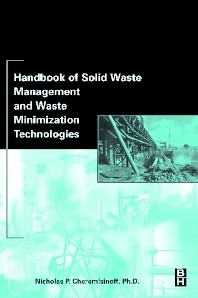 Handbook of Solid Waste Management and Waste Minimization Technologies is an essential tool for plant managers, process engineers, environmental consultants, and site remediation specialists that focuses on practices for handling a broad range of industrial solid waste problems. In addition to equipment and process options, the author presents information on waste minimization practices that can be used in conjunction with or can provide alternatives to equipment and process investments. Environmental cost accounting measures and energy-efficient technologies are provided. Valuable information for those concerned with meeting government regulations and with the economic considerations (such as fines for violations and cost-effective methods) is presented in a practical manner. Included in the text are sidebar discussions, questions for thinking and discussion, recommended resources for the reader (including Web sites), and a comprehensive glossary. Two companion books by Cheremisnoff are available: Handbook of Water and Wastewater Treatment Technologies, and Handbook of Air Pollution Control Technologies. (Each chapter includes: Introduction, References, Questions for Thinking and Discussing); What Solid Wastes Are (Municipal Solid Wastes, Industrial Solid Wastes, International Legislation and Treaties, Classifying Hazardous Wastes, World-wide Economic Considerations of Solid Wastes, Concepts of Pollution Prevention); Solid Wastes Handling Methods and Management (Industrial Solid Waste Handling and Disposal Equipment, Industrial Practices for Solid Waste Disposal, Analyzing the Cost of Solid Waste Disposal, Safely Handling Hazardous Solid Wastes); The Technologies of Incineration (Incineration Emissions, Incineration Energy Balance, Incineration Economics, Sludge Incineration, Wet Air Oxidation, Electric Incineration, Fluidized Bed Reactors, Pyrolysis, Miscellaneous Technologies); Volume Reduction of Solid Wastes (Solid Waste Shredders, Milling Reuse, Mobile Technologies, Solid Waste Compaction, Equipment Selection Criteria, Energy and Cost Comparisons Between Technologies, Deciding on Pollution Prevention Technologies); Sanitary Landfilling (Applications and Limitations, High Density Landfilling, Design Criteria for Landfilling, Liner Selection and Cost Comparisons, Siting Considerations: The Environmental Impact Statement, Airborne Sensing Considerations); Pollution Prevention Methods and Technologies for Landfill Operations (Methane Gas Recovery, Composting Technologies and Developing Markets, Economics of Recovery Operations, Introduction and Overview of Segregation and Recycling Issues, Small-Scale Cogeneration Options); Pollution Prevention Technologies (Processing and Reclaiming, Waste Minimization Practices and Technologies, Scrap Steel Recovery, Plastics Recovery and Recycling, Destructive Distillation, Cogeneration Technologies and Economics, Solids Recovery by Spray Drying, On-site Waste Disposal and Energy Recovery, Energy and Cost Comparisons); Establishing Environmental Management Plans (What ISO 14001 is All About, What EMAS is All About, How EMS Relates to Pollution Control and Solid Waste Management, Industry-Specific Pollution Prevention Technologies for Waste Management); Glossary; Index.